The silken pianissimo strings of the prelude, ravishingly played by the Swedish Chamber Orchestra, created an instant atmosphere of amore that persisted throughout the performance. Set designer Sven Östberg and director Alexander Niclasson have created a taut, sparse production without unnecessary subplots and nothing that conceals the central drama, which unfolds neatly and mercilessly before our eyes. The only thing that slows down the tempo is the opening of the Flora scene, which opens the second part of the opera – the interval is placed between the two scenes of act II – but this joyous party is on the other hand a welcome break in the tragic tidings and here, more than in most productions, the colourful gipsy dance is uncommonly robust and down to earth, far from the polished manners of the Parisian salons. What struck me at once was the director’s sharp focus on human reactions. Rarely have joy, surprise, sorrow, anger been so graphically expressed with small means, in gestures, movements, facial expressions. This is a production where every individual is three-dimensional and alive. 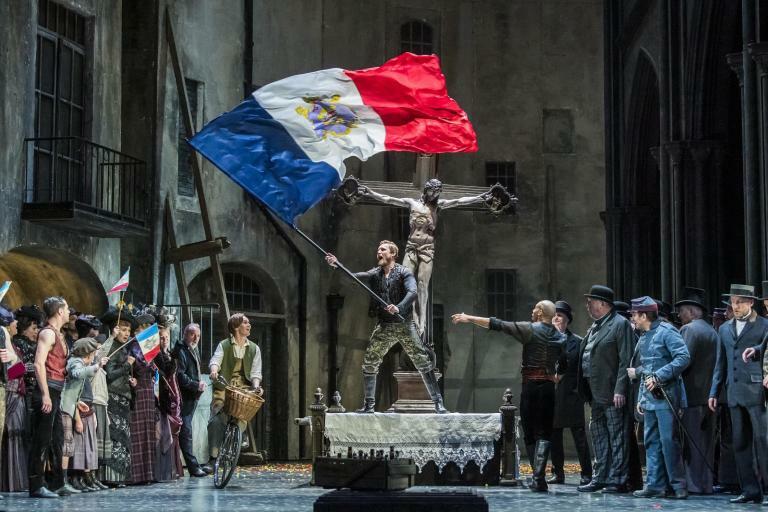 Alexander Niclasson has created an intimate chamber play, so sensitive to Verdi’s ambitions, so far away from the bloodcurdling historical tableaux of say Il trovatore. It should also be said that the production team has been very successful in their headhunting for suitable singing actors for the characters. Nine nationalities are represented in the cast – the three leading characters are doubled during the twelve performances – and it says a lot about the direction that they are a very homogenous team. The Polish soprano Ania Jeruc made her professional debut as recently as 2012 and this is already her seventh Violetta – and she is a tremendously good Violetta. During forty-five years of opera-going I have never encountered a Violetta who so completely fulfils all the requirements of the role – she has them all. She has the voice for the coloratura acrobatics of the first act finale, she has the spinto tones for the second act and she has all the nuances, which impress even more in her ravishing pianissimos, with no loss of vocal quality even when she is almost whispering. She is also a spell-binding actress, her face and body-language expressing all her despair in the second act confrontation with Germont pêre. I bet few of those present could hold back the tears when she sang Dite alla giovine, with her own eyes streaming with tears. By her side the others tended to get into the background. And yet they made honourable contributions. Byelorussian baritone Pavel Yankovsky, who also sang at Skäret two years ago, was a traditionally stiff and stern Giorgio Germont; not even in the last act did he relax, but his singing was everything one could wish, crowned by a warm and nuanced Provence-aria. American tenor Dominick Chenes has stage-presence and acted convincingly but took some time to warm up. In the last act he finally found his true form. The many minor roles were well taken with impressively sonorous bass singing from Swiss Roger Krebs as the Doctor. Considering that most of the choristers are non-professionals they sang and acted extremely well and there was true punch in the singing in the Flora scene. Marcello Mottadelli once again proved that he is a full-blooded Verdian. Last year’s Otello was a triumph in every respect, but this Traviata is on the same level and represents Alexander Niclasson’s most consummate achievement to date. A production not to be missed! Opernnetz is the leading german-speaking magazine for music theatre in Europe with more than 100.000 visitors monthly. We want to ask you to publish your review in German language (we will translate it) free of charge. For your response we thank you in advance.